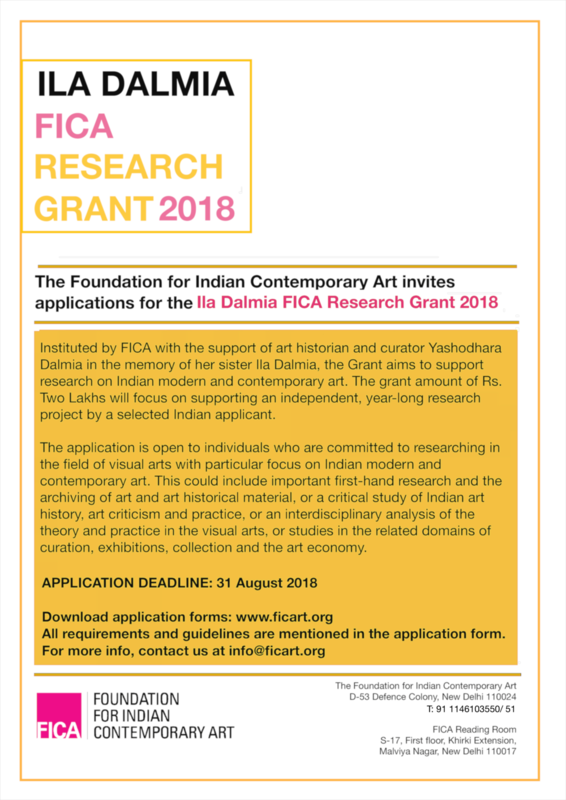 Instituted by FICA with the support of art historian and curator Yashodhara Dalmia in the memory of her sister Ila Dalmia, the Grant aims to support research on Indian modern and contemporary art. The grant amount of Rs. Two Lakhs will focus on supporting an independent, year-long research project by a selected Indian applicant. The application is open to individuals who are committed to researching in the field of visual arts with particular focus on Indian modern and contemporary art. This could include important first-hand research and the archiving of art and art historical material, or a critical study of Indian art history, art criticism and practice, or an interdisciplinary analysis of the theory and practice in the visual arts, or studies in the related domains of curation, exhibitions, collection and the art economy. You can read about the past recipients of the Grant here. Applicant should be above 18 years of age at the time of submission of application. Applicant should have a post graduate degree in humanities. Applications are open only to individuals. The proposal can be part of a larger research project that is currently underway. The applicant must clearly chart out what portion of the research will be undertaken as part of this Grant. Please include the following material in your application. Incomplete applications will not be accepted. Please include all the documents in a single email. You may use Google Drive Link/ Dropbox / or a similar such service to send your application to info@ficart.org with the subject line 'Application for IDFRG 2018' followed by your name. A Research Proposal (max. 2000 words) that gives a short description of the topic of study, research methodology and key research questions. The Bibliography for research. Please include images or videos of works to support your proposal if necessary. Two samples of published papers. You can also send an additional sample of unpublished writing. Names of two Referees with their complete contact details – name, position, organisation, telephone, email and postal address.